It's Thursday! That can only mean one thing at Crazy Shenanigans, it's Theater Thursday! Every week I pick one movie that's out on dvd to review and suggest to others. This week's featured movie is Vantage Point. In Vantage Point, world leaders including the US President have converged in Spain for a landmark agreement on terrorism. Just as the President is about to make his speech in the crowded town square, an assassin shoots him. Two of his secret service officers, Barnes (Dennis Quaid) and Taylor (Matthew Fox) immediately begin the search for the shooter. Before they can make progress, a bomb explodes in the square. Then everything stops and the day begins to rewinds. We get to see 8 people's different view points of the incidents. Each beginning 30 minutes prior to the assassination. We see it from a view point from an American Tourist (Forest Whitaker), a news correspondent (Sigourney Weaver), a Spanish police officer, a secret service agent, an assassin and even the President. This movie completely sucked me in. I was a little leery of watching it because I figured it would be just like any other thriller movie involving a President but it wasn't. I didn't even realize that it had been over an hour and a half when it was finished. It kept me wondering how it was going to end. If you've never seen it, then I really recommend it. As always, have a movie you love? Great! Post about it then come back here and link up. 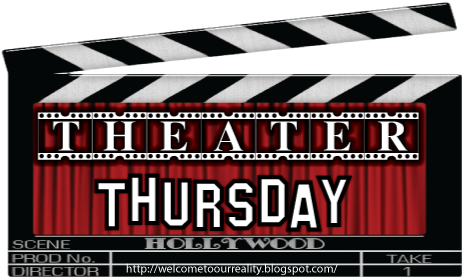 You can also grab the Theater Thursday blog button located in my sidebar. Just remember, the movie must be out on dvd and not in Theaters. That movie was awesome! I thoroughly enjoyed how little pieces of the story were exposed 1 at a time through the different perspectives. I just saw that movie a couple of weeks ago! I LOVE IT!!! Hey! I'm visiting via buzz on by Thursday! Your blog is so fun- I can't wait to read more! I'm your newest follower. 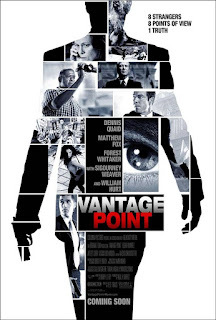 Vantage Point is a good movie, kind of threw a curve at the end I thought. I've never seen that movie. Sadly my horizons are pretty small when it comes to movies, I tend to stick with romantic comedies. That's too funny we have the same Louis bag! Hmmm I was never sure about how I felt about this movie but I'll definitely have to watch it next time its on!! I really enjoyed Vantage Point, although after awhile I was so tired of seeing the first parts of the movie over and over! i loved that movie!!! it was a good kind of suspense. I wanted to see this movie and forget about it - thanks for the reminder!